The principal of a local middle school is on a “temporary leave of absence,” according to school officials. Tom Beckett, human resources director with Maricopa Unified School District, said Principal Rick Abel of Maricopa Wells Middle School began administrative leave Friday. In his place will be acting Principal Thad Miller, Beckett said. A separate shakeup in administration at the middle school before Abel’s absence caused parent uproar on social media and during the district’s governing board meeting Wednesday night. Two weeks ago, the district transferred Thad Miller, who was MWMS assistant principal, to Maricopa High School to take the place of MHS Assistant Principal Mallory Miller, no relation. Mallory Miller moved from MHS to Thad Miller’s position at MWMS. During the school board meeting, friends and family of Thad Miller expressed their displeasure toward the district’s decision to remove him from MWMS, describing him as a favorite of students and staff. Superintendent Steve Chestnut said he made the decision to switch the administrators “in the best interest of MUSD.” Chestnut said he would not comment further on the matter when asked to elaborate. Thad Miller and Mallory Miller could not be reached for comment. 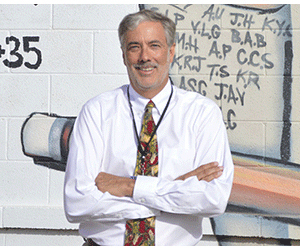 Only days into his position at MHS, Thad Miller finds himself back at Maricopa Wells – this time as interim principal. Beckett said he could not comment on the reason for Abel’s leave of absence. Abel also declined to comment. Abel joined MUSD in 2005 as principal at Santa Rosa Elementary. It is still unclear the reasoning behind most of the administrative changes at MWMS, but the school has recently come under fire for what parents assumed was a district-wide, zero-tolerance policy regarding student violence on campus. Wednesday’s school board meeting produced concerns from a parent of a Maricopa Wells student recently involved in a fight at the school. Julia Ivy said her son received the same amount of suspension as another student who, she said, was the aggressor. Ivy’s position was that zero-tolerance policies re-victimize students who try to defend themselves. Afterward, Chestnut clarified the district’s student violence policy as a “case-by-case” issue, adding, it does not have a zero-tolerance policy in place at any of its schools and student safety is MUSD’s top priority.